There's loads of Dota, Overwatch, League of Legends and Rocket League on the horizon. The 2017 Hearthstone Winter Championship concluded in the Bahamas this week, with ShtanUdachi defeating Fr0zen to take home the winner's slice of the $250,000 prize pool. Meanwhile, the League of Legends LCS is heating up as we near the final stages of the tournament. There’s plenty to watch from the Dota 2 Asia Championships to the Overwatch: PIT Championship. We even have the Rocket League Championship Series to look forward to. All the details on this weekend’s events can be found below. The Giants had another tough week and they desperately tried to climb up from the bottom rankings, but G2 and Fnatic crushed their hopes of making it to this year’s playoffs. Meanwhile, Roccat managed to surprise everyone with their 2-0 victory over Misfits, which has given the team a chance to rival Fnatic for third place. Vitality on the other hand continued to prove that they are one of the most inconsistent teams in the EU LCS. They played extremely passive against Splyce, which resulted in two games with a lot of one-sided action. Vitality looked like a completely different team when they played their second series against H2k. Game one went in H2K’s favour, but Vitality’s managed to come back in game two by creating pressure around the map. However, a Baron throw saw H2K steal away game three and they broke open Vitality’s Nexus after a very close performance. This week’s schedule and stream can be found over on LoL Esports. Cloud9’s series against Dignitas was a close one, but a clutch teamfight and major plays from Jensen’s Orianna gave C9 the power they need to dominate Dignitas. Phoenix1 were next on C9’s hit list and they proved critics wrong when they beat P1 2-0, which landed them with a place in this year’s playoffs. Meanwhile, Dignitas managed grab their playoff spot by eliminating Immortals, and they’ll be looking to secure another decisive win against Phoenix1. Meanwhile, Team Liquid tried to avoid relegation in week nine by picking up two victories against TSM and FlyQuest. 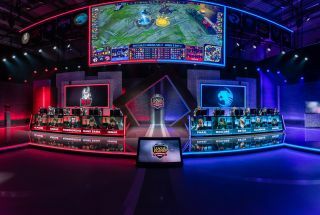 Team Liquid’s managed to beat TSM after DoubleLift’s Ezreal obliterated TSM’s bot-lane and carried his team to victory. However, FlyQuest’s Hai managed to stop them dead in their tracks with his Talon plays, and he secured a playoffs spot for FlyQuest and a promotion tournament spot for Team Liquid. The summer promotion starts today and the full schedule and stream can be found over on LoL Esports. The Dota 2 Asia Championships group stage finished with Empire and OG taking the helm for the western teams entering the upper bracket, while Newbee and Invictus Gaming are the two Chinese representatives. The main event will feature a double elimination bracket, and the winners of each group will battle it out for a chance to land a place at the lan finals. OG and Newbee are kicking things off in the upper bracket today at 18:00 PDT / 03:00 CEST, while LGD.Forever Young will tackle iG Vitality in the lower bracket tomorrow at 02:00 PDT / 11:00 CEST. The full weekend schedule and stream can be found by heading over to the official championship site. Lunatic-Hai faced Meta Athena on Tuesday during a tense semifinal match which saw the previous runner-up’s take Athena down for their third chance to win a major championship. Lunatic-Hai obliterated Athena on both Nepal and Eichenwalde, and they continuously punished their over-aggressive plays with decisive payload pushes. Lunatic-Hai will now face RunAway in the APEX finals on April 8th, but the APEX action doesn’t stop there as Meta Athena will take on LW Blue to contest the bronze title. The match begins today at 03:00 PDT / 12:00 CEST and you can catch all the action over on Twitch. The best Overwatch teams from Europe and North America have been busy fighting it out for their chance to claim the PIT title and their share of a $15,000 prize pool. Ninja’s in Pyjamas and Misfits are currently at the top of the European bracket, but this could soon change. SNG Ninjas and Movistar Riders are kicking this weekend’s action off today at 09:00 PDT / 18:00 CEST, while the North American branch will see Rise take on LG Evil later at 16:00 PDT / 01:00 CEST. Both the European and North American schedule can be found here, while the stream can be found over on Twitch. Week three of the Rocket League Championship: Series is underway this weekend when NRG take on Denial Esports this Saturday at 12:00 PDT / 21:00 CEST. So far Selfless look to be the team to beat as they recently qualified for the playoffs with four wins. If Selfless can beat Atelier and G2 Esports this weekend, they can easily hang on to the top spot in North America. Meanwhile, European team Pocket Aces now sit at the top of the leaderboard after beating both Penta and Cow Nose in week two. The previous European leaders The Leftovers will be looking for a decisive win when they tackle Penta this Sunday. Make sure you check out out the full schedule and stream over on the official Rocket League: Championship Series website.